He was the son of Halvdan the Black. 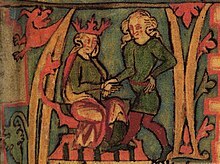 Harald was the first petty king to gain control of the coastal areas of Norway. After the battle of Hafrsfjord in 872 Harald became king of most of Norway. It was the last of a series of battles between Harald and other feudal states in Norway. Because of Skaldic poems (poems honouring heroes in Scandinavia), we know that he was successful in fighting against his opponents in Norway. Eric Bloodaxe and Haakon the Good, his two sons, became King after he died of old age. Fairhair may have had as many as 11-20 sons according to different Sagas. Twelve of them became Kings[b] and were all assigned land. ↑ The "Tale of Harald Fairhair" dates from about 1230 or later. It is based on the Heimskringla and an older "Harald Fairhair" saga that is now lost. The "Tale of Halfdan the Black" also draws on now-lost sagas of earlier dates. The "Saga of Olaf Tryggvason" was not compiled until the 14th century. It is based on an earlier version written down by monks about 1180–90. It also contains information from the Hiemskringla. ↑ The number twelve may suggest a biblical influence by later authors. These numbers can and do occur in oral histories but they can also show a later influence. Iceland had converted to Christianity by the end of the 10th century. Most of the later sagas were written in Iceland.